Slow Food USA believes that slow food, as in cooked from scratch, shouldn’t have to cost more than fast food. They decided to put their philosophy to the test with The $5 challenge. September 17th was the day to take back the “value meal” by cooking a meal from scratch that costs no more than $5 per person. My twist on the challenge was to use one chicken as the basis for three meals that each feed four people, with each meal costing no more than $5. That gives me $1.25 per serving to work with. Day 1: Herb Roasted Chicken Legs & Vegetables served over Garlic Polenta. 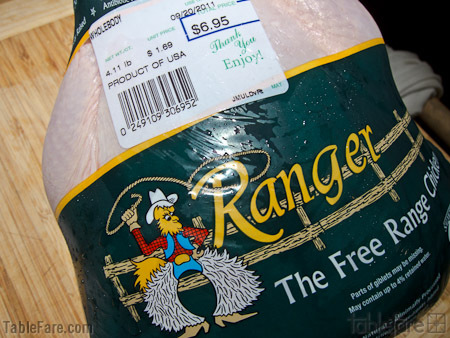 This 4.11 pound chicken is the basis for three meals. First things first, Chicken butchery. Not a difficult thing at all as long as you think finesse rather than brute force. With a little practice, it’s a task that can be knocked out in nothing flat. The key is learning to slip your knife between the joints rather than trying to cut through bones. 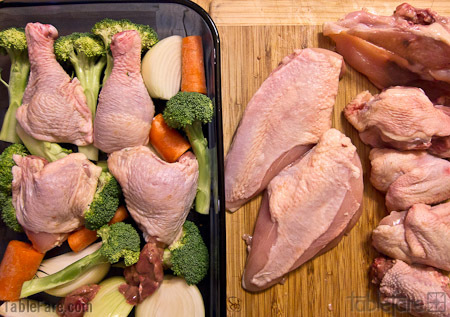 Take on a whole bird and you’ll be rewarded for your DIY prowess at the register because the cost per pound of a chicken you cut up yourself is significantly less than buying pieces-parts. The rewards for DIY butchery don’t end at the cash register. Just like a box of Cracker Jacks or the coveted secret decoder ring hiding in the dark depths of a cereal box, there are surprises in your chicken if you’re lucky. Plunge your hand into the bird’s cavity and see what you pull out. A neck? Score! Liver? Score! Heart? Score! There’s no guarantee that you’ll get the bonus parts, but it’s exciting when you do because it’s more good stuff to work with. The third big reward for going with a whole bird, is the carcass. You have the bones to simmer for stock…don’t click away at the first mention of stock making, hear me out. The reason you always hear that homemade stock is far better than anything you can buy is because it is, but as I recently learned it doesn’t need to be the big production that it usually is. I’ll explain shortly. Whole chicken portioned into three meals. Here’s how I decided to parse out my chicken, the thighs and drumsticks will be roasted with veggies for meal one. The breast meat, separated from the bone, will become shredded chicken filling for tacos on day two. The bones and remaining parts will be gently simmered in water to form the basis for soup on day three. (Gently simmering the bones in water is actually all there is to stock. No big production, I promise.) I was lucky and found good bonus-parts surprises hiding in my bird. The neck goes in the soup pot and the liver in the roasting pan. 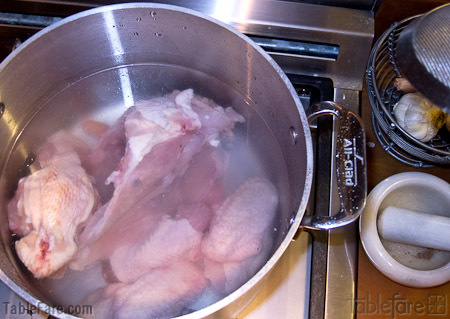 Chicken bones in water is a flavorful start on a pot of soup. I’ve been reading Michael Ruhlman’s new book, Ruhlman’s Twenty: 20 Techniques 100 Recipes A Cook’s Manifesto . In it he presents twenty core cooking skills that once learned set you up to be able to make just about anything, recipe or not. 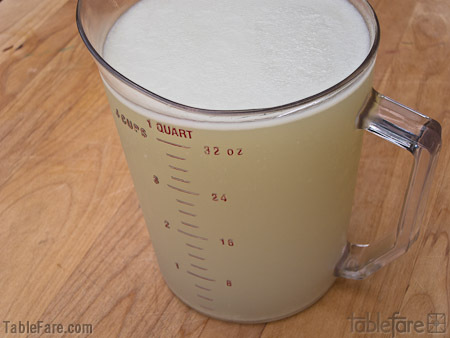 I especially like his treatment of stock as a sub-technique in the chapter, Water: The Unrecognized Miracle in the Kitchen. He rightly points out that most people are intimidated by the perceived effort of making stock. I make stock enough that it’s become a routine process, but when I find myself short admittedly my first thought is to head to the store for a can. Ruhlman has effectively removed that thought from my mind for good. With my $5 budget I didn’t have the money to buy an onion or carrots or celery for the stock. 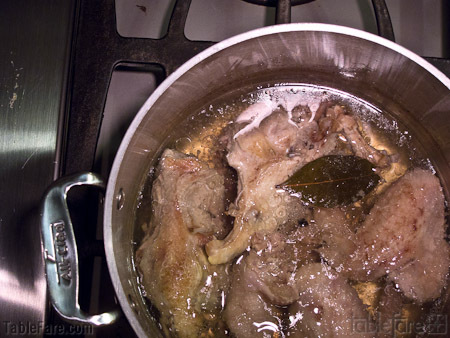 I trusted Michael Ruhlman’s argument that a homemade stock of just chicken bones without all the areomatics would still be better than than stock from a can. I simply covered the bones and miscellaneous chicken parts with about two inches of cold water, tossed in a bay leaf, a few peppercorns, and the ends of the carrot I’d cut up to be roasted. I set the pot on a low heat and let it come up to the barest simmer. Not letting it boil or even fully simmer keeps the liquid clear and beautiful. You know what? That Ruhlman fella is right. I started my stock right after cutting up the chicken and let it simmer while I went about making, eating and cleaning up from dinner. About 3 ½ hours later I had just over four cups of clean fresh tasting beautiful stock. No big pots. No need to set up rows of storage containers to be filled, labeled, and wrestled into the freezer. No fuss. My soup for day three’s recipe is already well underway. Homemade chicken stock, the minimalist way. 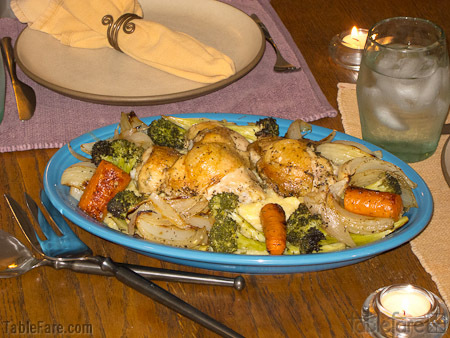 The Herb Roasted Chicken and veggies require nothing more than tossing the veggies and chicken with a bit of oil, vinegar, and seasoning and letting it roast in the oven for 45-50 minutes. Making polenta is just as easy involving only boiling, stirring, and simmering. This meal requires very little tending to during the cooking process. For this minimal effort a dinner so satisfying with great flavor, texture, color and nutrition is your reward. 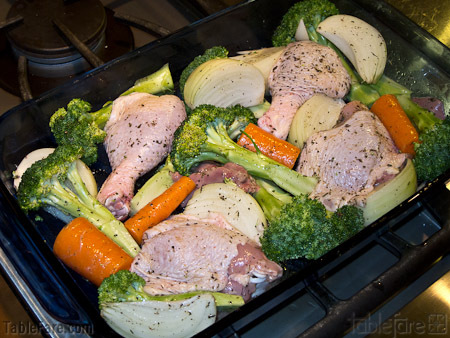 Chicken and veggies ready for the oven. As easy as these recipes are, it did make me realize that there is one important element to the success of slow food over fast food, and that’s cooking skills. Would someone who has never cooked before know the difference between simmer and boil? Or ever consider buying a whole chicken with no idea how to cut it up? Cooking skills matter and it’s the reason I’m so passionate about volunteering for Share Our Strength’s Cooking Matters program. It’s a free six week cooking and nutrition class for low income families. All the recipes we use in the classes are targeted to cost about $1.68 per serving so families receiving SNAP benefits can afford to make them. With low cost recipes and cooking skills, slow food can win out over fast food even for families living below the poverty line. I’ll grant you that it takes time and effort to shop and plan meals, but the return of taste, nutrition, and quality family time spent preparing and sharing a meal together is, as the saying goes, priceless. 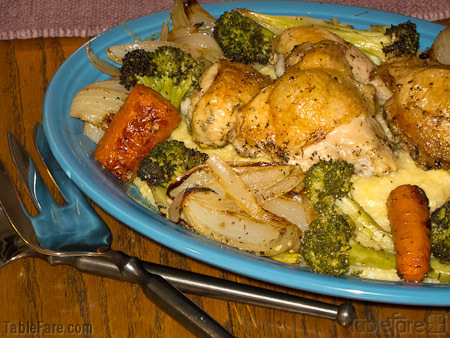 Herb Roasted Chicken and Vegetables with Garlic Polenta. $5 total and serves four. If you have the means and are interested in further developing your core cooking skills I highly recommend the Rouxbe Online Cooking School. Like Ruhlman’s Twenty (which I also reccomend), Rouxbe focuses on technique and uses recipes as a way to practice core skills. TableFare is an affiliate site for Rouxbe and we are thrilled to be able to offer a free 14-day membership to their site so you can test drive their cooking school. If you do buy a month or year membership 100% of our affiliate commission is donated to Share Our Strength to help end child hunger and fund great programs like Cooking Matters. Here’s a little taste of a partial lesson from Rouxbe’s online cooking school. Of course you can also always donate to Share Our Strength directly too! My Herb Roasted Chicken and Vegetables served over Garlic Polenta was delicious and turned out to be enough to actually feed four people. If you aren’t limited to $1.25 per serving, adding a few more veggies and a nice green salad would round out the meal nicely. A little cheese or butter stirred into the polenta before serving would be a nice decadent touch, but certainly not necessary. Though this recipe is about as stripped down as can be, the flavor is there and I wouldn’t hesitate to serve it to dinner guests just the way it is. Here’s how my budget broke down. I made the decision to consider pantry staples like oil and seasonings freebies and not break out the cost per bay leaf or teaspoon of salt; that just seemed like too much minutia. I did, however, leave a little spare change in the budget as a good faith effort toward the cost of these unaccounted for staples. I hope Slow Food’s $5 challenge will inspire you to embrace the joy and satisfaction that comes with creating meals for yourself and people you care about. The only thing fast food really has going for it is that it’s fast. With some planning, I contend the food you cook can be just as fast when necessary, but there is something deeply satisfying about letting food happen in its own time and just enjoying the process. The meals for day two and three will be separate posts that I will link to once they are up. I’d love to hear what kinds of low-cost meals you like to make, please share in the comments. Tags: Cooking Matters, Michael Ruhlman, Rouxbe Online Cooking School, Ruhlman's Twenty, Share Our Strength, Slow Food USA, SNAP, The $5 Challenge This entry was posted on Sunday, September 18th, 2011 at 6:20 pm	and is filed under Books, Cooking on a budget, Food Projects, Rouxbe.com. You can follow any responses to this entry through the RSS 2.0 feed. You can leave a response, or trackback from your own site. Looks so good! It’s times like these I wish Ivan ate meet.